General sale begins at 10 AM on Friday, October 5. Subscribers to The Verve's mailing list will have access to advance pre-sale tickets which will be available at 9 AM on Thursday, October 4. THE VERVE BREAK THEIR SILENCE: "THERE'S NO ANGER ANY MORE"
The Verve have broken their silence about their surprise reunion. When the band announced a series of shows and plans to record an album back in June, they kept silent, letting their manager do all the talking. However, the quartet have now spoken to NME - their first interview since reuniting. The band split last time in 1999 following the release of album 'Urban Hymns' - although they had broken up once before in 1995. So bitter were relations in the group that frontman Richard Ashcroft suggested a Beatles reunion was more likely than the band ever getting back together. However, speaking ahead of their shows, which kick of in Glasgow on November 2, guitarist Nick McCabe explained that the anger the band members felt towards each other has well and truly subsided and when frontman Ashcroft approached the rest of the group about a reunion they all felt it was the natural thing to do. "Well, I think me and Si [Jones] sort of arrived at the same point, mentally really," explained McCabe. "We had quite a long time being angry about it, and then once you've sort of resolved a lot of things in your own mind about it, you kind of realize that it wasn't such a big deal in the first place." The band are now currently writing songs for a new album, and while they do not have a confirmed release date, frontman Ashcroft suggested fans will have something to look forward to sooner rather than later. "It's pretty early days, really, to say what the sound is, where we are right now," explained the frontman. "From the bits I've heard so far, it's got elements of all The Verve sounds that people are into. Tunes, jams, jams that'll morph into tunes, you know?" The band are now focused on their winter tour, with more dates rumored to be announced alter this year. "I feel like I've never played as well in my life," explained bassist Si Jones of the band's rehearsals so far. "And hearing Pete [Salisbury, drummer] after such a long break, he's never played as well in his life either. Richard's playing keyboards and guitar and we're all contributing. That's how we do it, it's very organic. We came in and...Richard's got some tunes, but in terms of jams, we came in and just pressed record and see what happens. 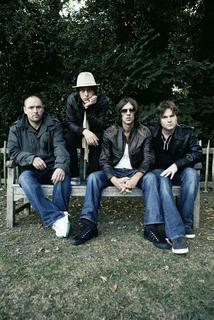 And what happens is The Verve." For an exclusive interview with the band, see this week's NME issue, out October 3.